Gong Xi! Gong Xi! The Year of the Water Dragon is just round the corner as the Metal Rabbit bids farewell. All Chinese from around the world will be celebrating the Chinese Lunar New Year come Monday, 23 January. Here in our multi-cultural Malaysia, it is not only celebrated by the Chinese but by all the other races as well. This is why I am grateful that I am living in a modern, multi-racial and multi-cultural country that is considerably peaceful, safe and free from devastating forces of nature. I am also thankful that Malaysia is a gastronomical paradise resulting from its multi-ethnicity ... there's just so many choices of tasty food to enjoy! To top it all, I am grateful that we have a lot of public holidays here to chill and de-stress due to the many celebrations and festivals of the different races. In fact, our country ranked 7th in the top ten list of countries with the most public holidays. Another week whizzes by, leaving a trail of moments to be thankful for. What Horace had originally wrote as a phrase in one of his odes, "Carpe Diem" has through time grown into a popular aphorism. 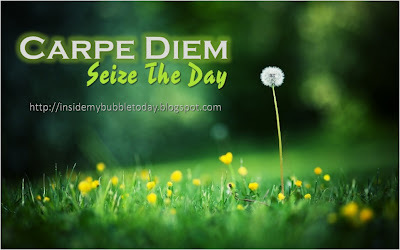 Translated, it means to "seize the day!" We should always bear in mind that there are no throw-away moments in our days. Every one and any one of these moments are important because they create an impact on our life ... good or bad it is entirely our own perspective. Just as Emmet Fox said, "The art of life is to live in the present moment, and to make that moment as perfect as we can by the realization that we are the instruments and expression of God Himself." So folks, seize your day! Everyday!! Because each day is a fresh opportunity to try again what we've failed before or to start something anew. Give thanks for every moment as they are God's gift to you!